In the previous article, we talked about how the government prepared for bringing about the boldest monetary reform in the country - Demonetization. 86% of currency in circulation was overnight declared void and new notes were brought in. The government planned for every potential scenario they could imagine but were prepared to handle situations unforeseen. Did they succeed in their endeavor or did it simply mean more pain for masses without apparent gains? Let's find out in this article. How has life been since the announcement? Reactions to the announcement were quick enough too. While the entire political class was confused on how to react to this unexpected move and could at best warn of cautious optimism, there were many who were a bit agiler and novel. People like me line in front of the ATMs to cash in something to have them going for the time being and they could wait for a week or two before worrying about the countable bills they had on their chest to be deposited in a bank account. However, one knows that there are not only people like me but also those whose chests were larger than our houses. There were people who earned in sacks and stored in sacks until they spent in sacks. The announcement definitely had them worried and so they had their ingenuity help them out in this moment of grave concern. They started resorting to any tactic they could. Since the banks were already closed and most other avenues of cash transactions had shut their business by then they resorted to unthought-of means. Such people jostled to find a jeweler or real estate agent ready to accept the cash payments and hoarded their place in kind. They were ready to pay any premium just to get rid of those bills they never accounted for. Jewelers had a field day selling out their stocks in a matter of hours and taking money home. Their problems were to start later but they enjoyed the moment. Then there were those who tried leveraging the loopholes - there was a guy who took six waitlisted tickets for the first class AC compartment in a train on the longest route in the country. All he wanted was to cancel them a couple of days later and get back his money in new currency. The government realized how people were trying to play the system and took steps to plug the holes, case by case. Well, it was a start of what was going to be a long story. This was one hell of an announcement with the potential to throw the country into haywire and apprehensions quickly surfaced in following days. Lines kept growing length rather than shortening and people began panicking. No one knew how this would turn up and everyone wanted every bill they had to be deposited in the banks so that they do not loose in the process. While there was hurry to deposit, there was also clamoring for cash. Everyone needed money for their daily essentials - people were left without food, milk, and groceries. The urbane class resorted to shopping malls and online services which accepted digital payments but what about the privileged lot? They had nowhere to go other than to beg for credit from the local shopkeepers they knew. It worked as India still is a sociable society to some extent but for how long. The shopkeepers themselves needed the money to buy the stuff they sold so it was a chaos at best. Things became murkier as the month changed and December arrived. Most of the start-of-month payments are made in cash - the maid, milkman, newspaper guy, car cleaner and what not. So the demand for cash just escalated but the supply was still not up to the mark. I spent a couple of hours twice in the first week and managed to get hold for about 8k which was just about enough to manage the payments. But then these are not the only requirements. I had a visit planned to hills with wifey during the holidays and I had another trip planned to Mumbai. I needed cash for each of those visits and this meant a couple of more rounds to the bank. I did manage to get something each time but there were those who returned empty handed. Well, things were indeed difficult and people were angry with all the pain. But guess what - the sentiment besieged all logic. Everyone still supported the decision. People hoped against all hope that the Prime Minister did take a bold decision to unearth all the stashed cash - concreted in walls, sewed in mattresses and beneath the tiled floors. Everyone I met - during my trips, during the waits in lines outside banks and during office discussions - believed that this would at least act as a warning shot. This guy at the helm was unpredictable and ready to take quo shattering decisions and this was definitely appealing to the masses on whole. Thus they drank the poison happily hoping that their coming generations would have better on offer. Now, this is something that is there over the top of everyone's mind who is not aware of India or how our economy runs. Even for those who are in the system, they have a vague illusion of all that this was suppose to achieve. Below are what could be called broad contours of the goal that PM must have had as he was deciding on this. In a single masterstroke, the government has attempted to tackle all three malice currently plaguing the economy—a parallel unaccounted economy or black money as known popularly, counterfeit currency in circulation and terror financing. This step is supposed to provide the Indian Economy with a kind of "reset" opportunity with most of the currency in circulation being renewed. Whatever cash there is in the economy would for at least once see the face of a bank teller and would go through a series of scrutiny. Unaccounted cash fuels a huge parallel economy in India. That parallel economy runs on the 6% unaccounted wealth held in the form of unaccounted cash. If this unaccounted cash comes back into the system it does become accounted cash and will no longer be able to fuel the parallel economy. No one in his right mind would withdraw accounted currency and use it as unaccounted cash. Therefore a large part of the parallel economy will be forced to go mainstream. The only challenge remaining for the govt. would be to curtail the generation of unaccounted cash so that the cycle does not start again. The unaccounted wealth held in the form of real estate and gold will have to be sold against accounted cash if there isn't any unaccounted cash available to be paid. Therefore this one stroke of demonetization can easily curb all unaccounted wealth and bring it into the accounted domain. It is not rocket science to understand that counterfeit currency is generally circulated in highest denomination notes to impact most. So, by demonetizing the highest currency notes the government aimed to most of the fake currency out of circulation in one stroke. Further, one can also deduce that a lot of terror financing occurs either in counterfeit currency or cash in higher denominations. The funds to terrorists are bound to be a collateral damage through this process. While the usual benefits are inherent, there were additional positives which this step was supposed to yield. One, it will lead to huge amounts of money deposited in bank accounts which had been lying out of banking system and will now come to the circulation. This, in turn, will enhance the liquidity position of the banks, which can be utilized further for lending purposes. Further, once the funds stored unaccounted come to mainstream, they would come under the tax-bracket and hence tax collections would automatically increase. Many also believe that this would lead to moderation in real estate prices which are sort-of at an artificially elevated level. One would also hope that there would, at least temporarily, be a halt to corruption to some extent. Why was it so messy? Many would feel that it shouldn/t be such a major issue that notes are being exchanged. There are some notes that people have which would be renewed. All they had to do was visit a bank, deposit what they had and take the new notes. However, no one who knew the Indian economy ever imagined it to be a smooth ride. Government and RBI had made great arrangements and were yet ready to proactively respond to issues that would come up eventually. As expected the entire process was messy and mucky and created chaos among the masses. economy. On top of this, India is primarily a cash-driven society. Most transactions happen in cash and even bigger merchants favor hard cash to digital means. It is estimated that about 90 percent of transactions in India occur in cash. What exaggerated the pain was the psychology of how the masses reacted to the step. To start with there was a panic among the risk averse population of the country. No one knew how the things would turn up and hence everyone lined at banks to have their money deposited. The banks were not ready for such a step and hence did not have the operation capacity to handle the rush. A number of tellers were a bottleneck along with the currency in supply from the RBI. Further, frequent change in rules did not help the situation and simply contributed to anxiety. What does RBI do with the defunct bills? There is a well-established system at RBI for disposing of the defunct bill. RBI regularly disposes of mutilated and soiled notes after they are taken out of the circulation. However, the magnitude of the disposal this time was unprecedented. 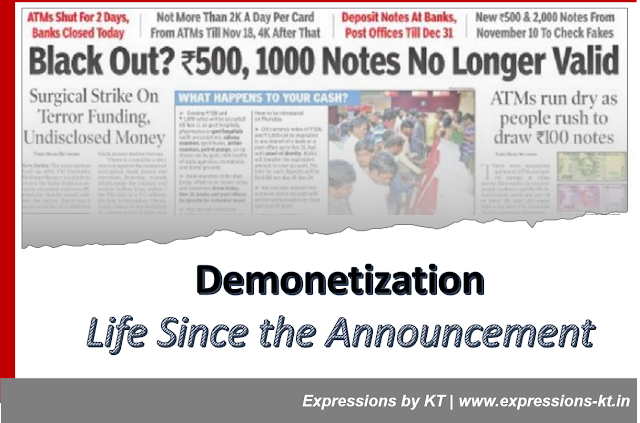 The demonetization exercise sucked a huge amount of currency notes out of circulation. As the notes started coming in after the demonetization announcement RBI made special provisions for disposal of notes this time. The Reserve Bank of India will now shred and pulp the huge mountain of defunct currency for recycling. Banks will be asked to collate all their old notes in neat stacks and bundle them carefully before sending them to the designated RBI branch. The notes are reconciled with the accounting records to verify accuracy in documentation before proceeding further. Most RBI branches have a shredding center attached to them where these bundles are turned into heaps of short strips of currency paper. The shredded strips are then recycled into pulp under close supervision to ensure the irreversible conversion from currency to the pulp is achieved and there is no chance of misusing the old bills. The pulp can further be used for multiple purposes - office stationary, briquettes (for heating or bonfire fuel) or other places where a hard paper is needed. However, this system has only been established recently as awareness about environment gained focus. Earlier, until 2001 RBI used to incarcerate the old notes. shredded notes will be tossed with fine wood chips and then passed through a heavy press. The briquettes will be largely sold for industrial use via tenders. Where are we today - what did the mammoth exercise achieve? Today, after about 3 months after the announcement, re-monetization has largely been achieved and lines in front of banks have reduced. Normalcy is still some distance away, but the chaos has mostly been sorted. The country may soon forget the pain it went through in some time however, it isn't business as usual for many through this process. However, once the dust has settled, it is time to ask if something has been achieved in all this madness. The "reset" aimed at with the step is achieved to some extent. However, the implementation wasn't perfect. The black market economy was somehow able to exchange their currency through "unofficial channels". The leakages would still be investigated at a later point of time but largely the belief is that the banking system malfunctioned at some stages. Of course, the black money market had to pause for some time, they have recovered to some extent. The extent of the market would have reduced but the elimination aimed has not actually been achieved. Now how this turns out would depend on follow-on steps that the government brings out. Next, the aim of eliminating counterfeit currency was obviously achieved as the currency itself is changed. However, the consideration should be how long would this last. It is being said that the new currency would be difficult to imitate but it is the only time that will tell a real story. The counterfeit currency market has time and again proved its capability of minting currencies throughout the world. The only way to prevent it is through continuous enforcement and crackdown on those spreading the menace of fake notes. The immediate benefit that was achieved was peace in Kashmir. Until the announcement, the state was boiling and violence was rampant. As soon as the notes were made defunct, the violence stopped overnight. the funding to terror groups has dried to some extent and this has definitely borne fruits. Another benefit achieved is acceptance of digital modes of payment. When the cash was difficult to put hands on, people had to resort to using of alternate means and PayTM became a household name. So true benefits would only depend on what happens from now. The black money market would only try to attempt in advancing its expanse. Regeneration of unaccounted wealth in the form of cash can be henceforth curbed by the government with well-targeted steps. Further, if unaccounted cash comes back as accounted cash through various channels, the government needs to take steps to check its credentials and tax it heavily. A curb on corruption coupled with the use of plastic in lieu of cash will help curb regeneration of unaccounted cash. So demonetization will have its benefits provided future regeneration of cash is curbed. Does the govt. have the will and wherewithal to take an appropriate step? If yes, then demonetization will work wonders, if no then it will not only have proved unnecessary but also totally disastrous.